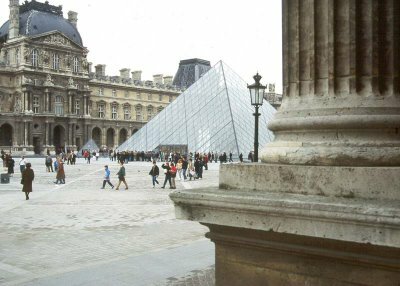 Susan Spano, a travel writer for the Los Angeles Times, writes a blog about her experiences in Paris called “Postcards from Paris.” Her observations and insights are often interesting. 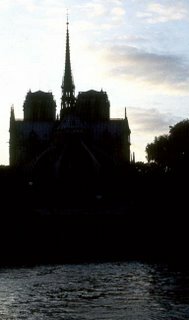 In her blog entry for January 29, however, Ms. Spano cannot resist that all-too-familiar urge to be critical of Paris architecture. She mentions five examples of what she calls “really ugly modern buildings that don’t seem to belong” in her vision of what Paris should look like. She does single out the Louvre pyramid and the Pompidou Center as exceptions (really ugly modern buildings that do seem to belong?). We’ve all done it. Architecture is out there for us all to see, and we all have our opinions. It’s like art. Actually, it is art. And, since opinions are what blogs are for, here is mine: on this topic, Ms. Spano is full of, well, merde. Her first offender, l’Hôpital des Quinze-Vingts, is a building that I don’t know, so I cannot comment on it. But I do know the other four. Bad Building #2 is the Faculté des Sciences at Jussieu in the Latin Quarter (photo below). Yes, the complex was built in the 1960s, but it is a fine, although perhaps not the most elegant, example of the modern, or international, style of architecture. The buildings do suffer from functional problems and are currently undergoing renovation and a massive asbestos removal. 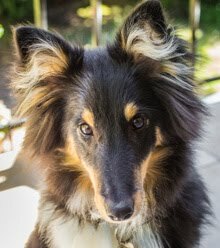 But, are they inherently ugly? I don’t think so. In fact, I quite like the way the ordered, rectilinear complex highlights the more organic feel of the older city around it. Spano’s third ugly duckling is the UNESCO headquarters complex in the 7th Arrondissement ( center right in this photo). Here there is a serious lack of maintenance that doesn’t help matters, but the curves of the Y-shaped main building work quite well on the semi-circular Place de Fontenoy, reflecting but not copying the form of the other buildings on the Place. According to Spano, the building’s primary fault is that it was “designed in the 50s by a team that included the noted International School architect Marcel Breuer.” Gee, that really nails it. Next in Spano’s gun sights is the Montparnasse tower, a 52 story office building at the end of the rue de Rennes . Her criticism: it’s “totally out of scale, at 680 feet, so you can't avoid it.” There are many tall structures in Paris, and a lot of them can be seen from a distance, depending on where you are in the city, and many of them are more offending than Montparnasse. 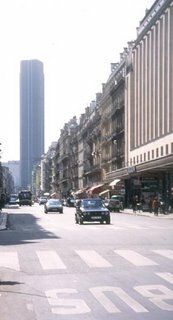 The Montparnasse tower boldly punctuates the rue de Rennes like an enormous exclamation point. It’s bowed exterior walls are quite elegant as they rise skyward and reflect the rising or setting sun. The tower’s location lines it up nicely with its more adored sister, the Eiffel Tower. The views of the city from the 52nd floor observation deck rival those you get from the Eiffel Tower, and you don’t have to wait in those long lines to go up. Finally, Spano quickly dismisses the Les Halles complex in the center of the city as “equally notorious” and reports that it will undergo a major makeover (see photos in my previuos post). Ok, but why does she think it’s ugly? She doesn’t let us in on it. The buildings are mostly underground, topped by a green park of significant size. Trees, shrubs, grass and flowers. 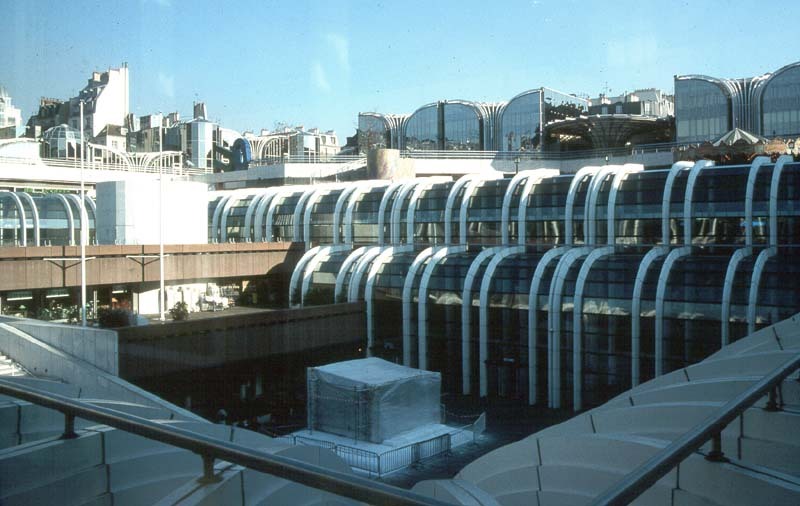 The underground shopping center, or Forum, is visible from the street level, its white steel arches and glass walls taking two curved jumps down into a central courtyard whose purpose is most likely to bring natural light into the corridors of the mall. 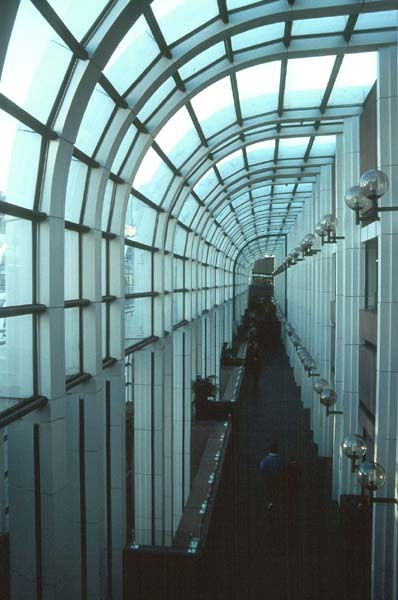 The steel arch and glass wall motifs are repeated in above-ground buildings on two sides of the Forum. They provide a very modern counterpoint to some of the historic (and not so historic) buildings that border the site. Les Halles may not be everyone’s architectural cup of tea, but it successfully reconnected neighborhoods that bordered the former central market halls on the site and gave Paris some much needed breathing room in an otherwise congested central city quarter. I’m looking forward to the makeover, but probably not for the same reasons as Susan Spano. The heart of Paris could be said to beat at Les Halles, although this merchant quarter was once described by Emile Zola as the “belly of Paris.” From the 12th century through the 20th, food markets operated here and became the central wholesale market for the ever-growing city until they were moved to the suburbs in the late 1960s because of traffic congestion. After the food markets, however, came the retail center, modern hotels, and souvenir shops. 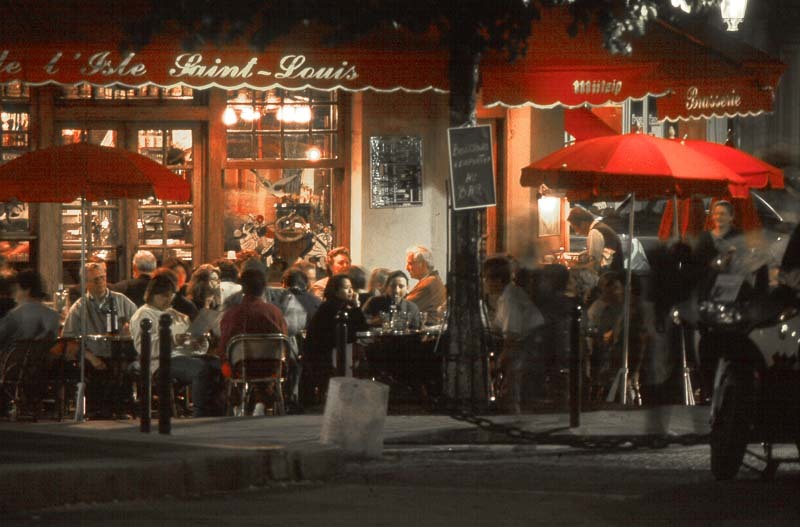 New restaurants and cafés sit beside some of the oldest food establishments in Paris. The neighborhood streets teem with shoppers, street artists, young people and tourists. Five métro lines and three RER lines intersect in the levels below the street, as do several express tunnels for automobile traffic. The multi-level underground shopping mall, the Forum des Halles, is built around a central light well. Start your walk in the Forum des Halles, the multi-level underground shopping mall at the Châtelet-Les Halles métro stop. Make your way to the exit known as Porte Berger on the rue Berger which runs along the south side of the Forum. 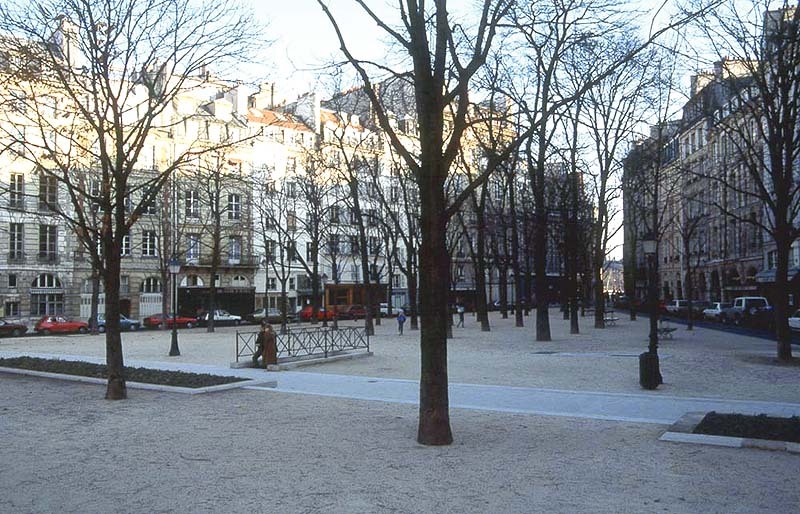 After you come up the escalator, turn right and walk a short distance on the rue Berger, then turn right again into the Jardin des Halles along the Allée St.-John Perse. Continue along this diagonal pathway through the garden toward the gothic/renaissance church of St. Eustache. The garden you are walking through has only existed since the 1980s; it is a contemporary version of a formal French garden. 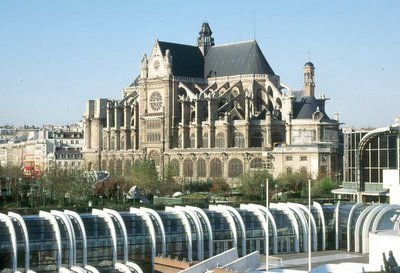 The church of St. Eustache, whose bell towers were never completed, as seen across the Jardin des Halles, with the Forum in the foreground. To the west, on your left, you can see the circular commodities exchange building, the Bourse de Commerce, where futures in wheat, flour, sugar and other goods are traded. The current building was erected in 1889. The Bourse de Commerce seen from the Forum. 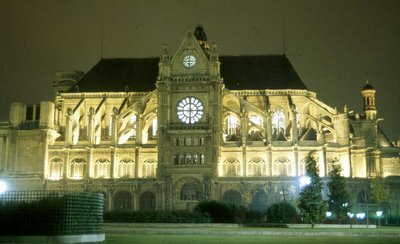 Continue to St. Eustache. Just outside the church in the Place René Cassin is the striking stone sculpture l’écoute by Henri de Miller. The church itself was built between the 15th and 18th centuries and even though it represents an amalgam of architectural styles, the result (even without its bell towers) is glorious. 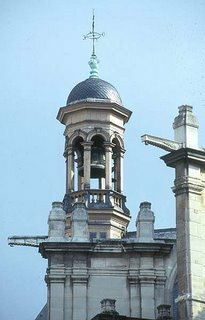 At left is one of the church's architectural details. Today, seen from across the garden at nightfall, the church is lit to dramatic effect. At the eastern end of the church, along the rue Rambuteau, the rue Montorgueil (seen at right) starts its northward run. Worth a side trip, this very old working-class street has recently gone upscale with the renovation of Les Halles. Old restaurants and marginal residential buildings have been gentrified into chic cafés and eateries and pricey apartments. The street was re-paved in the 1980s and retains just a bit of its old market-street charm. 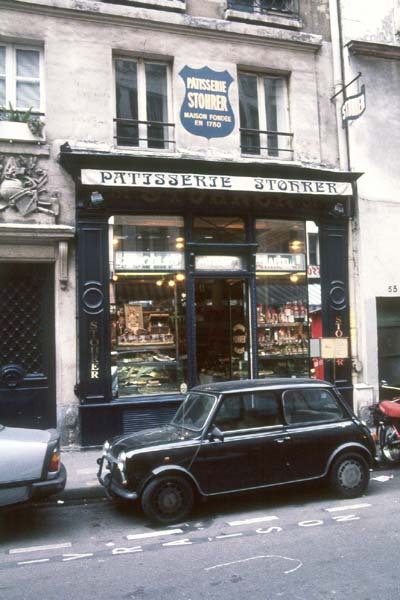 The Patisserie Stohrer on the rue Montorgueil. Continue eastward along the rue Rambuteau along the north side of the forum complex. Turn right into the rue Pierre Lescot, pass the main entrance to the forum/métro/RER complex on your right, and walk into the Square des Innocents at the rue Berger. In the center of this animated square is the Fontaine des Innocents, constructed in 1550. This square was a cemetery in the 12th century; the skeletal remains of those buried here were relocated in the late 18th century to make way for a fruit and vegetable market. 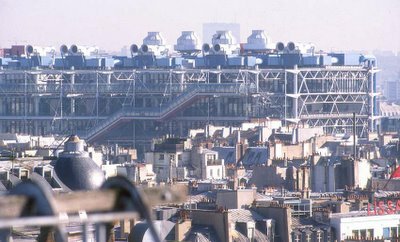 Top, The Pompidou Center, seen from the bell towers of Notre Dame Cathedral, rises above the Paris rooftops. Bottom, a ground-level view. Turn left and walk eastward along the rue Berger, rue Aubry le Boucher and the rue St. Merri until you come to the vast Place Georges Pompidou in front of the Pompidou Center. Beginning in 1969, this neighborhood underwent a significant transformation. 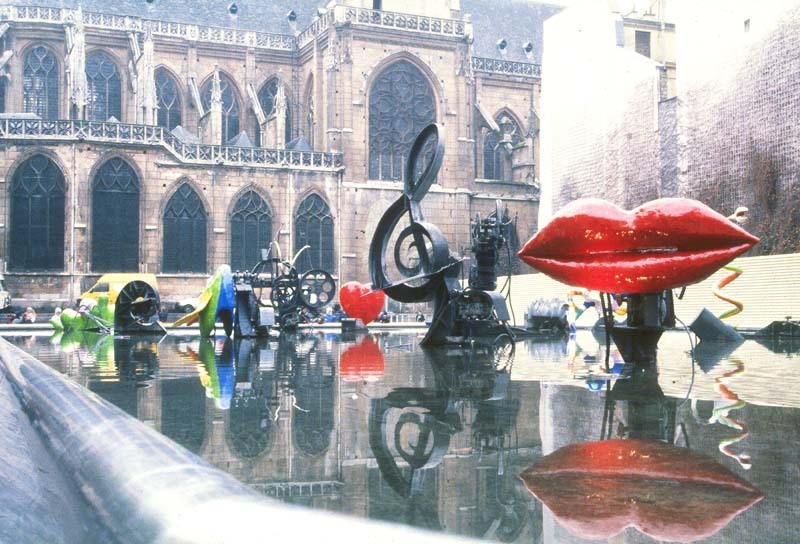 Its focus was to be the home of Paris’ center for modern/contemporary art. 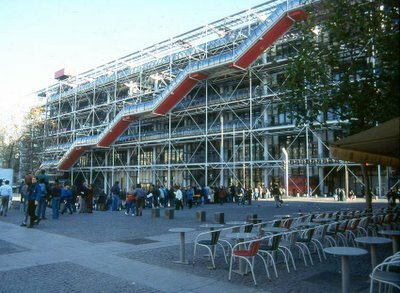 Richard Rogers and Renzo Piano designed the building to maximize flexible interior floor space by placing most of the mechanical and circulation systems around the exterior skin. The result is an impressive multicolored industrial-looking structure that was completed in 1977. Whole blocks were rebuilt in the neighborhood, modernizing the housing stock and adding retail space. In some cases (especially along the rue Saint-Martin), historic façades were retained with new construction just behind. 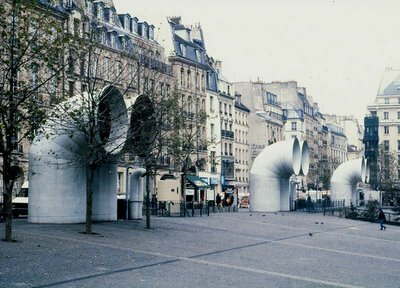 Giant funnels ventilate the parking garage beneath the public square in front of the Pompidou Center. The façades of the buildings here were preserved with new construction just behind. At the southern end of the Pompidou Center building, across the rue Merri, is the Place Igor Stravinsky with its whimsical animated fountain. Just beyond is the 15th century gothic church of St. Merri. Whimsy and color mark the Place Igor Stravinsky and provide an interesting transition from the modernism of the Pompdou Center to the gothic elements of the church of St. Merri. Return to the Place Georges Pompidou and continue northward. Turn right onto the rue Rambuteau. Cross the rue du Temple and the rue des Archives. The street becomes the rue des Francs Bourgeois as you enter the Marais neighborhood, yet another fascinating part of the city that merits much more exploration if you have the time. The streets around the Forum des Halles and the Pompidou Center pulse with pedestrians. The myriad shops and cafés mixed with apartments and offices make for a vibrant city center. Reclaimed from lowlands along the river (the word marais means swamp in French), this section of Paris became a fashionable location when wealthy citizens built their mansions here. After the French Revolution, the upper classes left the neighborhood and it declined until the early 1960s. Then, the government stepped in to preserve many of the historical buildings and a revitalization of the neighborhood got under way. 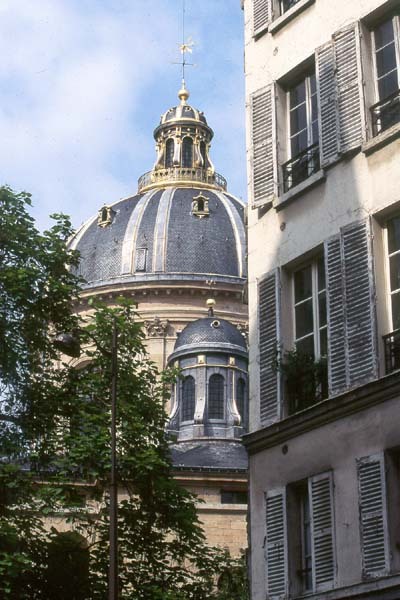 Today the Marais is home to museums (the Picasso Museum in the Hôtel Salé, the Kwok On Museum of Asian theater on the rue des Francs Bourgeois, and the museum of Paris history in the Hôtel Carnavalet are among them), galleries, boutiques, restaurants, and pricey residential real estate. 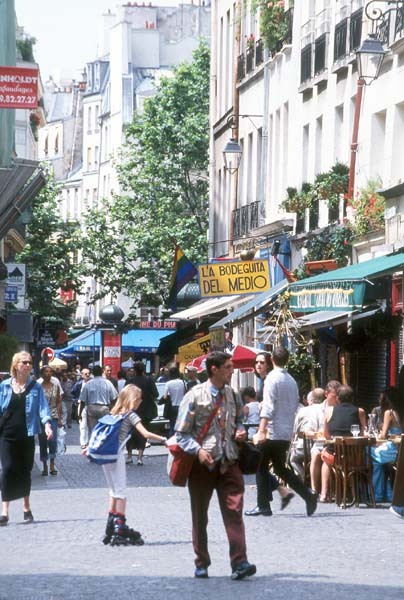 Gay restaurants, hotels, and cafés can be found in the streets along the rue Vieille du Temple, and the Jewish quarter thrives around the rue de Rosiers. In the rue du Bourg Tibourg is Mariage Frères, a large tea shop with its own exhibits on the history of tea. 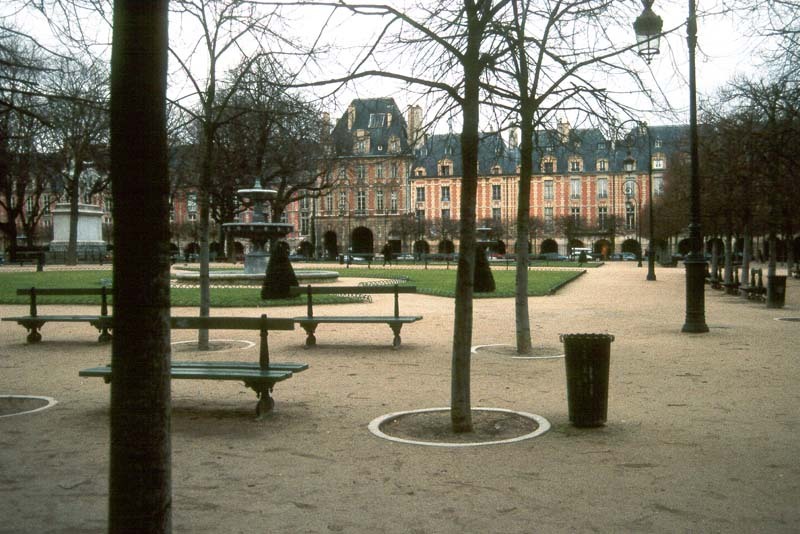 Continue past the shops along the rue des Francs Bourgeois for several blocks and enter the Place des Vosges. Built during the 16th and 17th centuries in the popular Italian Renaissance style, the square was originally called Place Royale. Its houses, nine on each side, were built symmetrically and were the homes of Paris aristocrats. 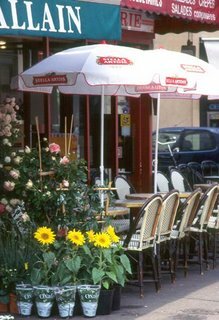 On the northwest corner of the square, under the arcades, is the café Ma Bourgogne, a wonderful place to sit and enjoy breakfast or sip a coffee. The writer Victor Hugo lived in one of the houses on the opposite corner of the place in the mid 19th century. Exit the Place des Vosges on the south side, through the Pavillon du Roi into the rue de Birague. At the rue St. Antoine, you can either turn right and make your way back toward Les Halles, or turn left and head to the Place de la Bastille. 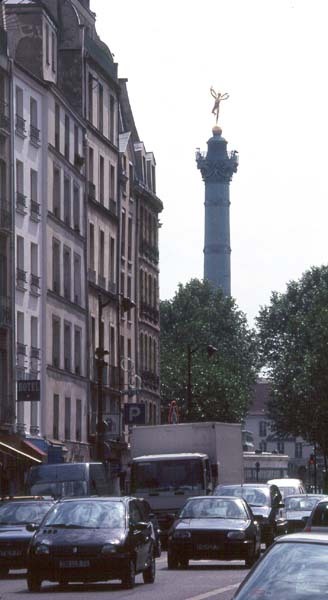 At right, the Bastille column, above left, a café on the rue St. Antoine. The next tour will take us through the Latin Quarter. Look for it toward the end of next week! Amélie at a press conference. 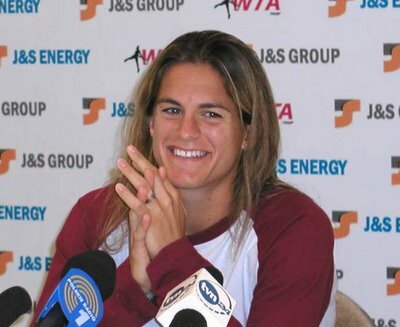 Photo from Amélie Mauresmo - the fanpage. French tennis star Amélie Mauresmo is in the finals of the Australian Open Grand Slam tennis tournament this weekend. She'll be playing Justine Henin-Hardenne, from Belgium. Whoever wins, the champion will be francophone. How about that! *UPDATE* 28 January: Amélie played very well and should be proud. Even though her win was due to Justine falling ill and forfeiting in the second set, Amélie's performance in the match and throughout the tournament demonstrated her prowess as a champion. Here's to a speedy recovery for Justine, and to continued success for Amélie! Today, I made a lemon tarte, tarte au citron in French. 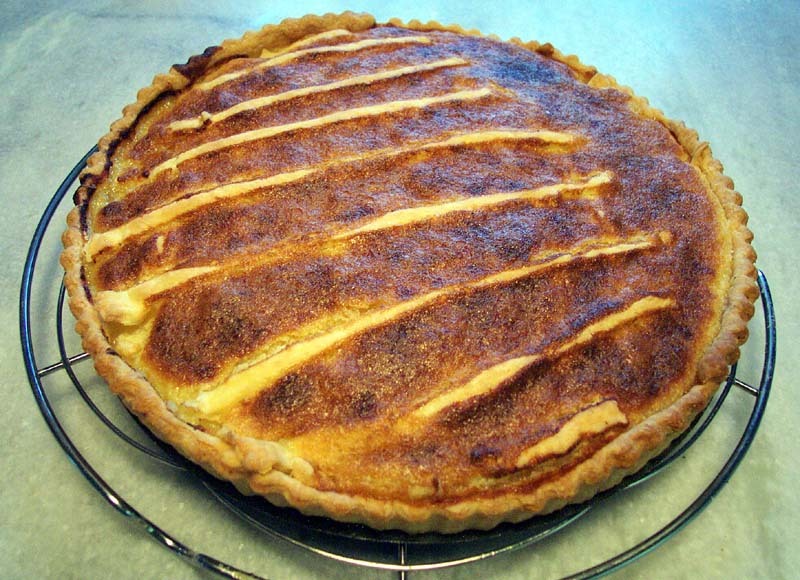 There are many types of recipes in France for the tarte au citron. 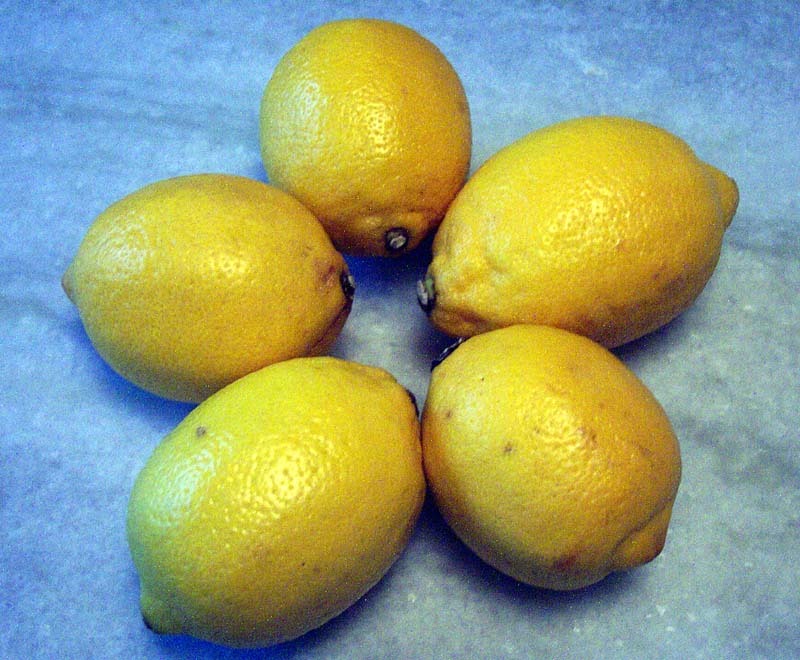 Some are like the british/american lemon meringue pie. I made one of those last week and it was good. But the traditional french kind is very plain, if that's the right word. 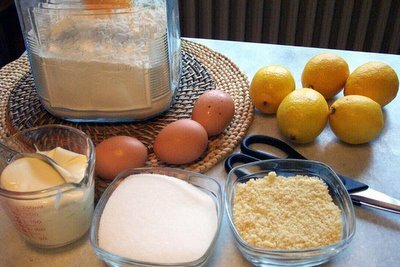 It's just a pie with a short lemon custard. The recipe I made today is a bit fancier. 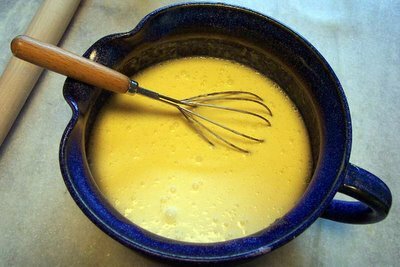 It has almond flour and crème fraiche, making the filling a bit more like custard than usual. The ingredients: eggs, crème fraiche, sugar, almond flour, lemons. 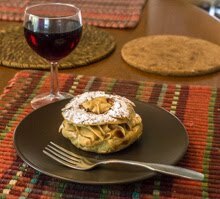 First, I made a pâte brisée (this link will take you to my recipe; click the "back" button on your browser to get back here) and blind baked it. 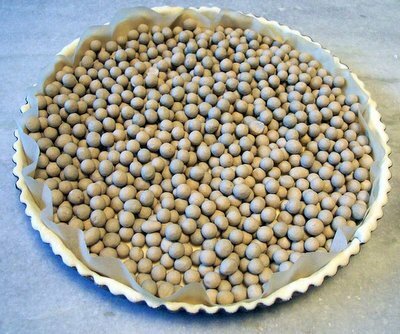 The crust is "blind baked," meaning that it is pre-cooked with pie weights before the filling is added. Next, the ingredients were eggs, lemon juice and lemon zest, ground almonds (or almond flour), and crème fraiche. I put strips of dough on top, but they sank into the lemon filling. Oh well. 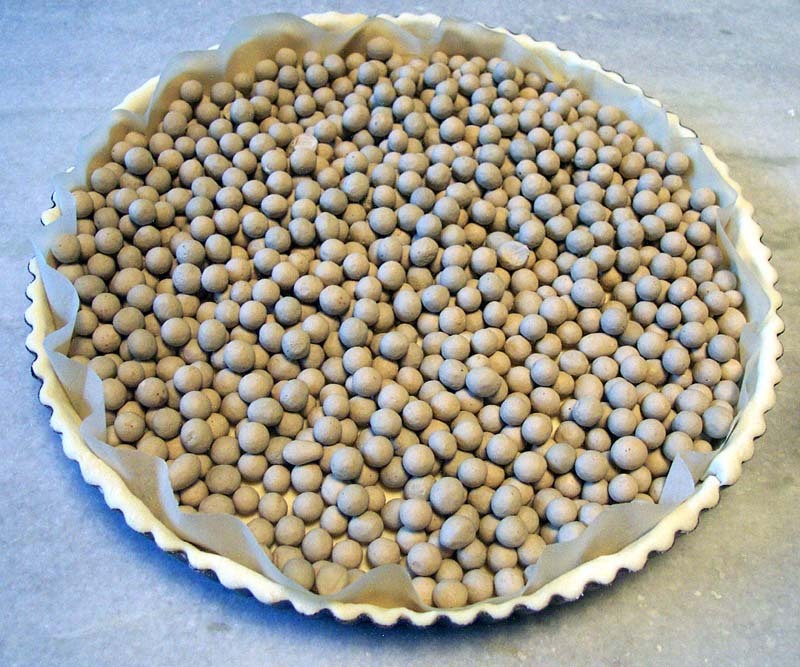 The batter, ready to go into the pre-baked crust. It baked very nicely for about 20 to 25 minutes. And here's the result. The pie is pretty, but the desired effect of crossing lines of crust didn't pan out. 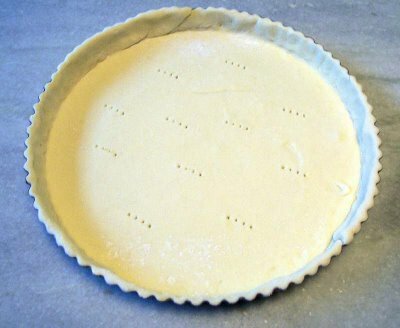 Most of the crust strips sank into the filling. Oh well, maybe next time! Bon appétit! Photo du Jour : Fill 'er up ! Or, in French, faites le plein. 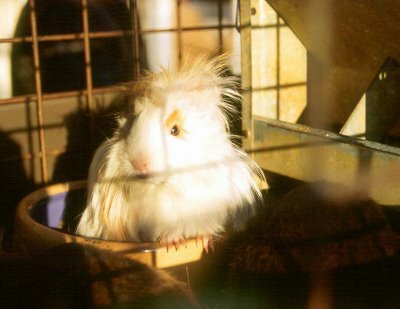 I took this shot in Toulouse, southern France, way back in 1989. I don't remember what the women were looking at. By the way, this is not self-service; the woman with the white smock over her clothes is the gas station attendant. 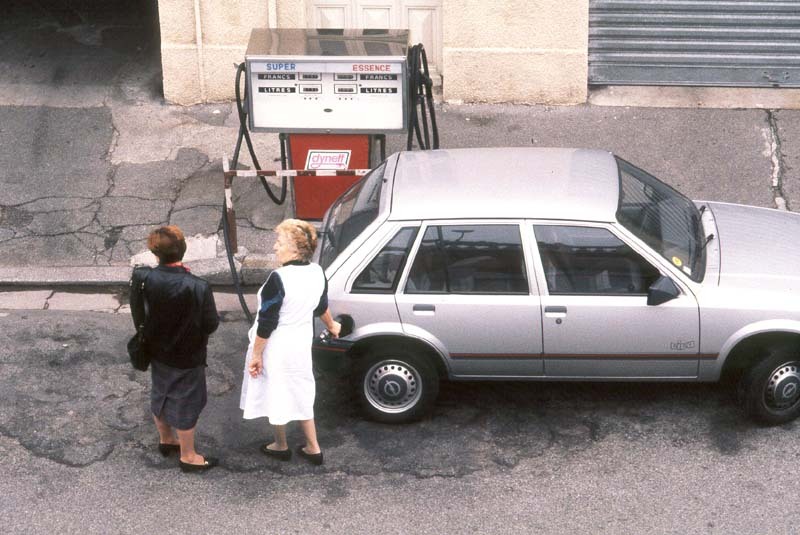 Gas stations in French cities typically have a pump or two on the sidewalk and drivers just pull up to the curb for service. Often there will be a service garage in the building where the pump is, with cars being worked on inside and probably a few floors of apartments above. In the suburbs and in the country, stations are more likely to resemble the American variety. 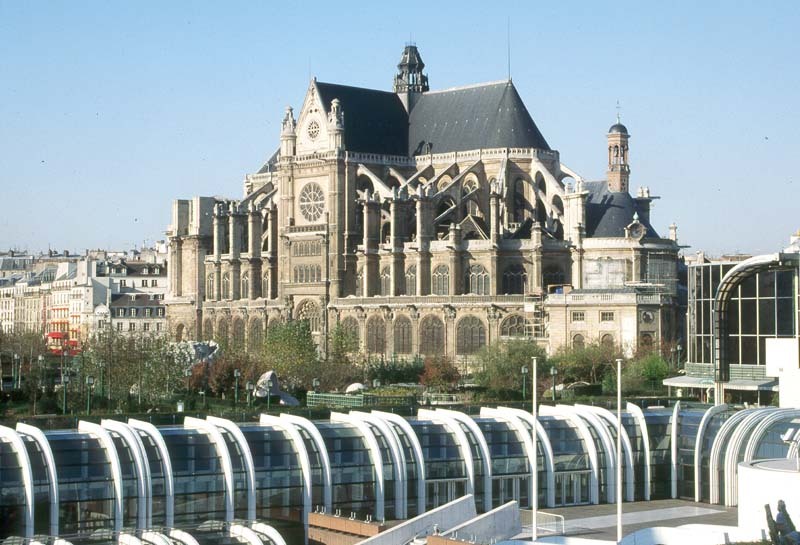 Look for the next in the series of Paris tours this weekend: Les Halles and the Marais. 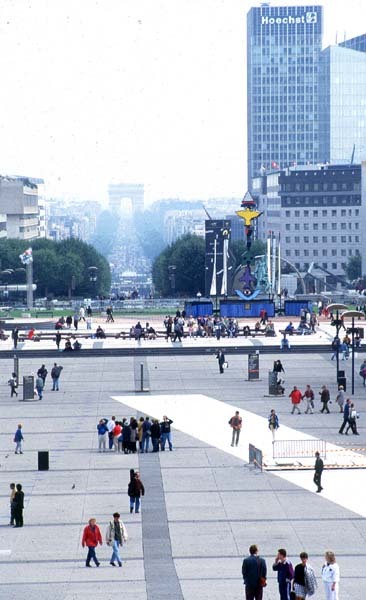 All city planners know the Champs-Elysées as one of the world’s great streets, but the street itself is only one part of a much larger urban axis that has taken form over centuries. 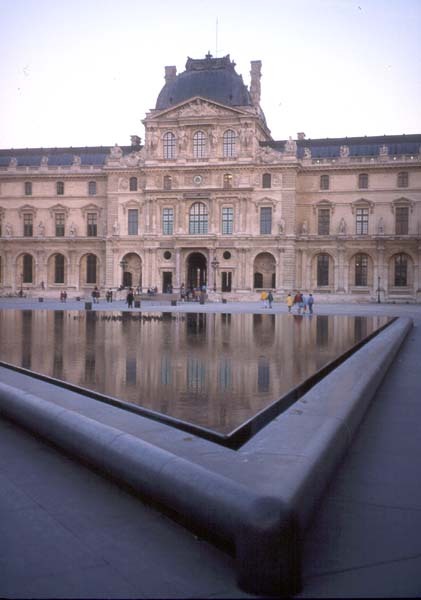 Beginning in the central courtyard of the Louvre palace, the axis stretches over eight kilometers to the modern skyscraper suburb of La Défense to the northwest. 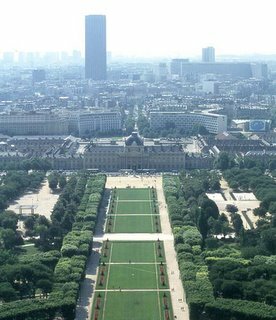 The Historic Axis stretches westward from the Louvre (center right) and Tuileries Garden along the Champs-Elysées to the Arc de Triomphe and beyond to the modern skyscapers of La Défense (upper left). This view is taken from the bell towers of Notre Dame Cathedral on the Ile de la Cité. 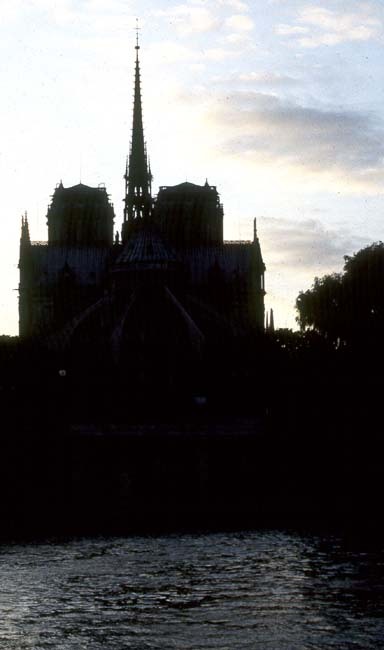 The Saint Chapelle rises up in the center of the photo. Start your walk at the Louvre/Rivoli métro station (corner of the rue de Rivoli and rue du Louvre in the 1er Arrondissement). Walk toward the river along the rue de L’Amiral Coligny. At the mid-point turn toward the massive eastern façade of the Louvre, cross the dry moat and pass into the Cour Carré (Square Courtyard). This is the starting point of the historic axis, which passes through numerous fountains, three triumphal arches, an ancient Egyptian obelisk, and one glass pyramid on its way west. 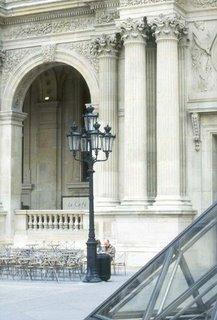 The photo above shows part of the historic Colonnade on the eastern façade of the Louvre, the roof of the Pavillon de l'Horloge with the Obélisque, the Champs-Elysées and Arc de Triomphe in the background. A view of the part of the Louvre that surrounds the Cour Carrée, or square courtyard, from across the Pont Neuf. This is the site of the original 13th Century medieval fortress. The Louvre is one of the world’s largest art museums and is a world (and tour) unto itself. Take the time during your stay to visit at least part of the museum. Planners may delight in the exhibit that chronicles the history of the building itself and culminates in a subterranean walk around the foundations of the original Louvre castle built on the site in the 13th Century. Those foundations are beneath the southwest corner of the Cour Carré where you are standing at this point in the tour. The Cour Napoléon and the Pyramid, which serve's as the museum's entrance. 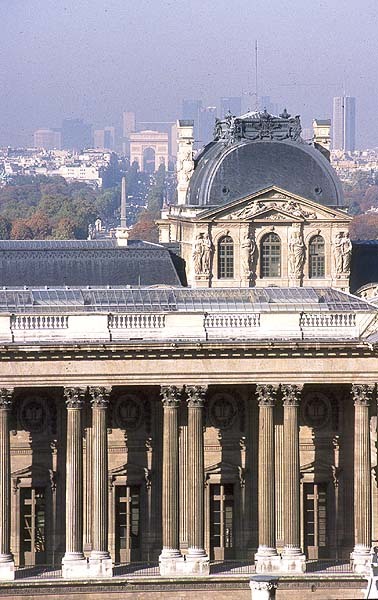 Continue westward and enter the Cour Napoléon, where you cannot miss I.M. 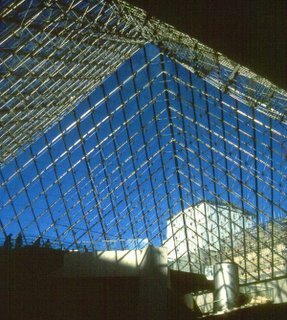 Pei’s famous glass pyramid, opened in 1989. Walk around the courtyard and take in the contrasting views of the sleek glass and intricate stonework of the buildings. 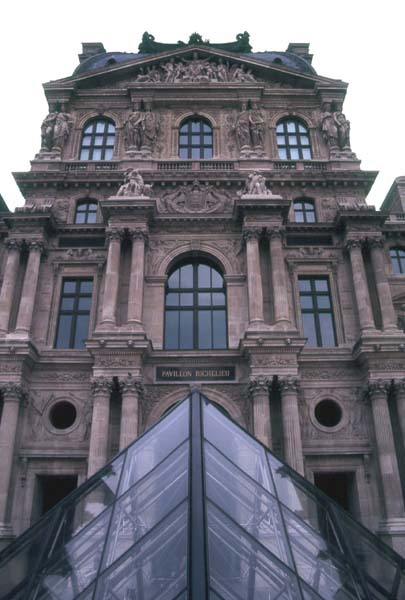 While the pyramid has been controversial, it successfully fulfills it charge to draw visitors into the courtyard and focus attention on the museum’s entrance (which was formerly a hard-to-find, inelegant door in the southeast corner of this courtyard, which also served as a parking lot for employees of the French Finance Ministry, once housed in the building). There is a fine café on the courtyard side of the Richelieu pavilion (pictured here). From the pyramid, make your way west to the Arc de Triomphe du Carrousel, completed in 1808 to celebrate Napoleon’s military victories of 1805. 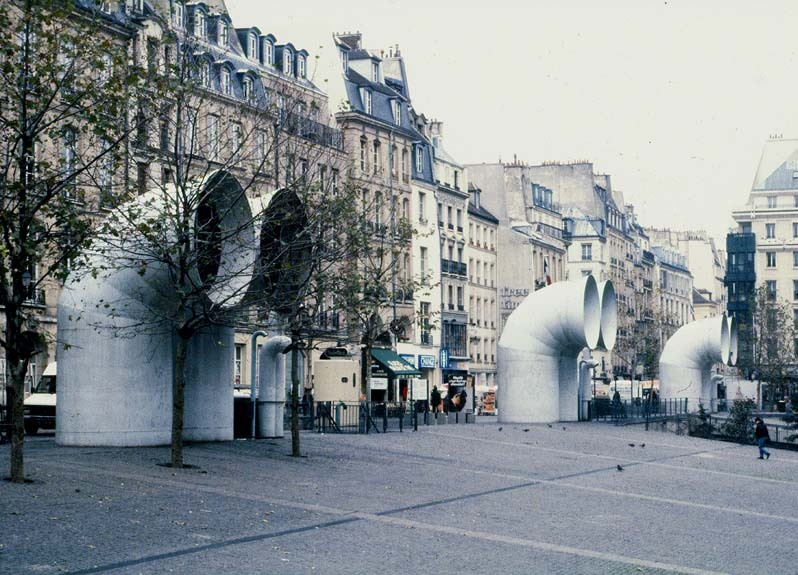 The gardens, walkways, and the street that passes in front of the arch were renovated in the late 1980s as part of the Louvre modernization and expansion project. 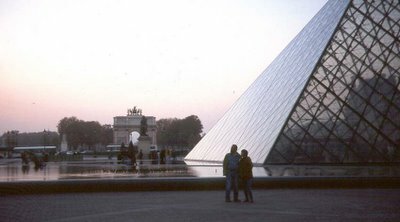 As you look again toward the west, the two extremities of the Louvre (the Pavillon de Marsan on the north and the Pavillon de Flore on the south) frame the view of the Tuileries gardens. Another view of the Pyramid looking toward the Arc du Carrousel. The Tuileries gardens are behind. The space between these pavilions was once filled by the Tuileries palace, a free-standing palace begun under Catherine de Medici in the 16th Century. Over the next two hundred years the palace was incorporated into the expanding Louvre complex until it was destroyed during the French Revolution. 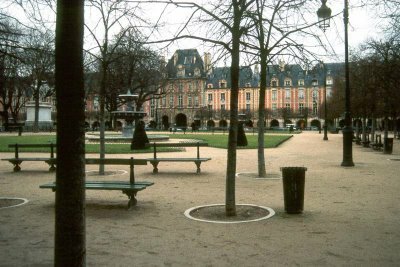 Tuileries means “the place where tiles are made” and refers to supposed activities on this site prior to construction of the royal palaces. The photo in this paragraph is the dome of the French Academy (home of the Académie Française), on the left bank across the Pont des Arts from the Louvre. Further to the west, walk into the Tuileries garden, a great example of a formal French palace garden. Its current form was designed by the French architect Le Nôtre in the 17th Century and includes classic parterres, tree-lined allées, fountains, terraces, and statuary. The garden, and others like it around the city, was once the royal court’s private playground. Now, of course, these magnificent green spaces are open to everyone and provide a relaxing escape from the frenetic street scene. On warm weekends, however, the gardens can feel more crowded and frenetic than the busiest parts of the city. The view from inside the Louvre's entrance, under the glass pyramid. An optional and interesting side trip from the Tuileries garden is up the rue de Castiglione to the Place Vendôme. At the far west end of the Tuileries garden are two grand terraces, each with a long rectangular pavilion on it. The pavilion on the north side is the Jeu de Paume (the royal tennis court) which for many years housed the Louvre’s impressionist collection until its move to the Musée d’Orsay on the Left Bank. The building now houses contemporary art exhibits. On the south side is the Orangerie (where tropical plants spent cold winters), converted as well to an art museum. 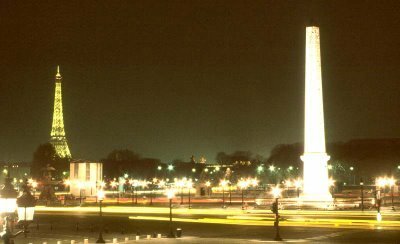 The Place de la Concorde at night. In the background, the Eiffel Tower rises up on the Left Bank to provide a counterpoint to the ancient Egyptian obelisk. 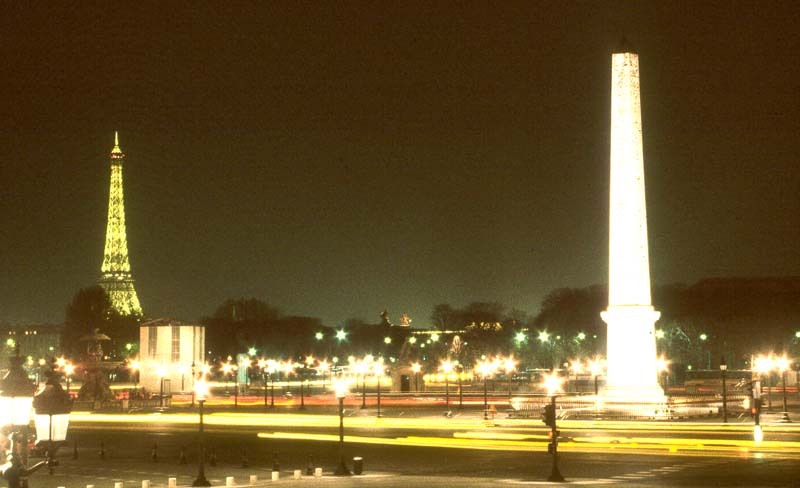 As you continue westward out of the garden, you will pass through, or more likely around, the Place de la Concorde. This grand 20 acre place began as a tribute to Louis XV, financed by local magistrates who commissioned an equestrian statue of the king for the site. 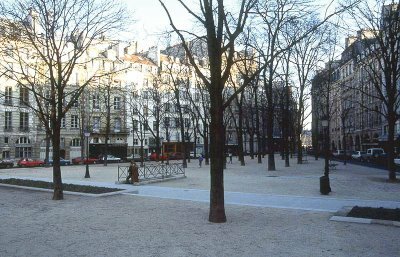 During the revolution the statue was removed in favor of the guillotine and the square was renamed Place de la Révolution. In 1795 the name of the place changed to Concorde and today it handles a significant flow of automobile traffic. It is worth making your way (carefully) to the center of the place where you will have an excellent view westward, up the Champs Elysées, toward the Arc de Triomphe and beyond to the Grande Arche de la Défense. 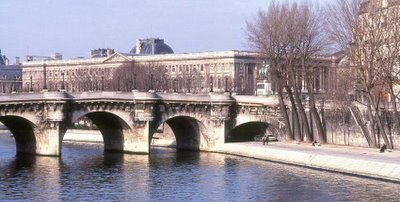 To the right you can see the classical colonnade of the Madeleine church, and to the left, across the river, the façade of the French National Assembly (both worthy of visits). 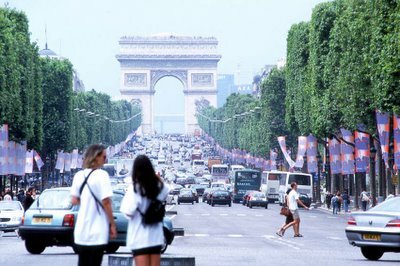 The Champs-Elysées. The Arc de Triomphe is dressed in bleu-blanc-rouge to mask scaffolding that surrounded the monument so the stone could be cleaned. Also here in the center you will get an up-close view of the Obélisque, a gift to France from Egypt in the early 19th Century. The monument is over 3,000 years old and was originally installed in the city of Luxor. It is flanked by two grand fountains. 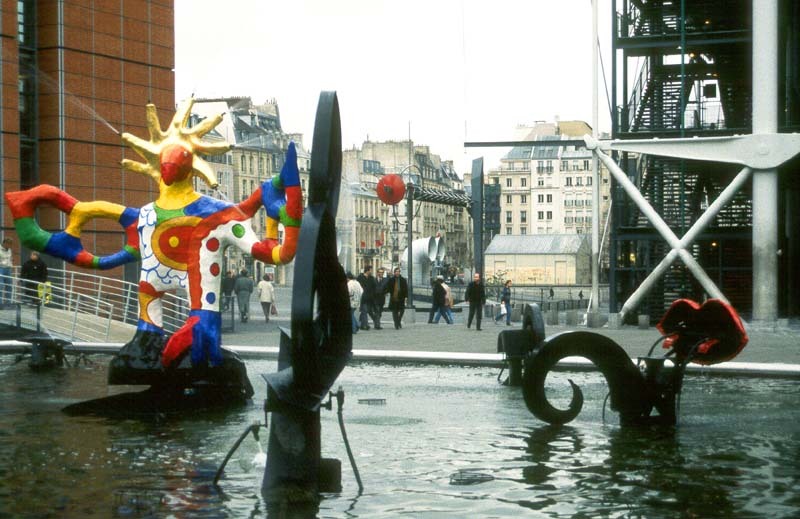 Around the place are eight statues named for cities in France (Rouen, Brest, Nantes, Bordeaux, Marseille, Lyon, Strasbourg, and Lille). 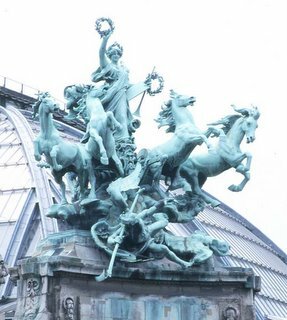 If the center of the place represents Paris, then these statues mark the general direction from Paris of each of the eight cities. The United States embassy occupies the northwest corner of the place. The recently restored glass roof of the Grand Palais glimmers in the sunshine. This view is from the Left Bank, across the Pont Alexandre III. Once you’ve negotiated the place, continue your westward walk up the Champs Elysées through the leafy green park that flanks the avenue to the Rond Point des Champs Elysées. You will pass by the back side of the Elysée Palace on the right, the French presidential residence, and the Petit Palais and Grand Palais on the left. 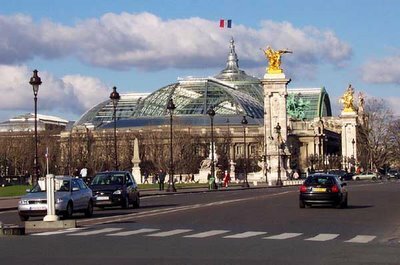 Built for the 1900 Universal Exposition, these two impressive buildings now house art and cultural exhibits and the Paris Beaux-Arts museum. The spectacular glass roof of the Grand Palais was recently restored to its sparkling glory. The Grand Palais’ rear wing is home to the Palais de la Découverte, a science and technology museum. A few streets to the north and nearly parallel to the Avenue des Champs Elysées is the rue du Faubourg St. Honoré which is home to many designer boutiques and is a favorite shopping stop for many visitors. There you can also find the embassy of Great Britain. 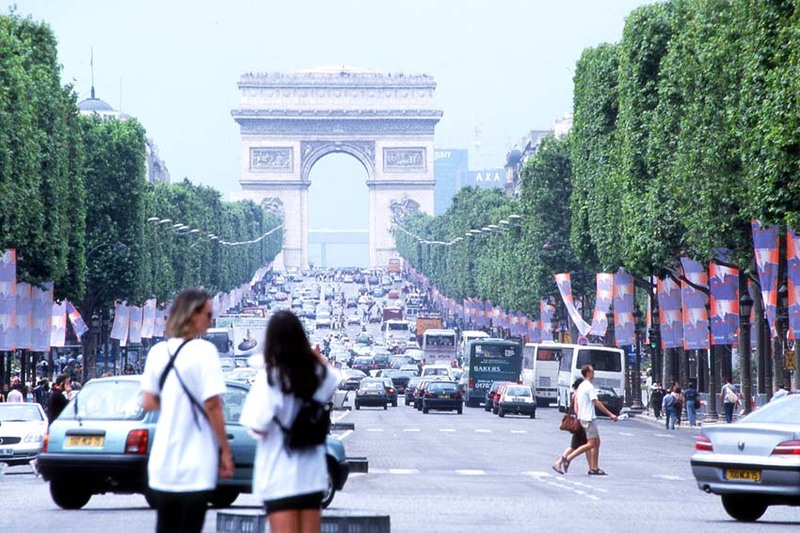 From the Rond Point to the Place Charles de Gaulle, the Champs Elysées is lined with restaurants, stores, boutiques, offices and car dealerships. It can be a tourist mob scene; watch for pickpockets and high priced cafés. In winter, the avenue is magically decorated and lit for the holidays. In summer, it hosts the annual July 14th (Bastille Day) parade and serves as the end point of the famous Tour de France bicycle race. Recently this portion of the avenue was renovated to expand sidewalks, replace street trees and street furniture, and to generally make it more pedestrian friendly. At the Place Charles de Gaulle, formerly the Place de l’Etoile, you can see one of the great elements of Baron Georges-Eugène Haussmann’s plan that transformed the city in the mid 19th Century. Haussmann served as the Prefect of the Seine under Napoleon III and directed all city planning activities. His team of architects and engineers cut wide boulevards through the medieval street pattern of the old city, updated the water supply and sewer systems, and created vast green spaces. He designed the étoile (star) of 12 avenues around the Arc de Triomphe and directed that the façades of the apartment buildings surrounding the place be uniform. A closer view of the Arc de Triomphe, minus the scaffolding, and the Champs-Elysées. 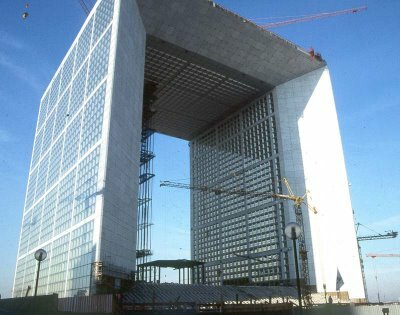 The faint horizontal bar seen in the center of the Arc is actually the roof of the 30-story Grand Arche de la Défense nearly 6 kilometers away to the west. Today, the place is a swirling mix of street traffic and pedestrians. To get the Arc, use one of the underground passages; negotiating the place on foot is not advised! Three métro lines and one RER line intersect beneath the place, making it one of many primary transfer points in the city’s rail transit system. The Arc itself is a monument to Napoleon’s war victories, memorialized in sculptures on each façade. Beneath the Arc is the flame marking the Tomb of the Unknown Soldier (WWI). Inside the Arc is a small museum with a great viewing platform at the top. Beyond the Arc de Triomphe, at the end of the Avenue de la Grande Armée and across the bridge over the Seine, you can see the modern skyscrapers of La Défense and the current end-point of the historic axis: the Grande Arche de la Défense. The fastest way to get there is on the métro #1 or RER A lines from the Charles de Gaulle/Etoile station. 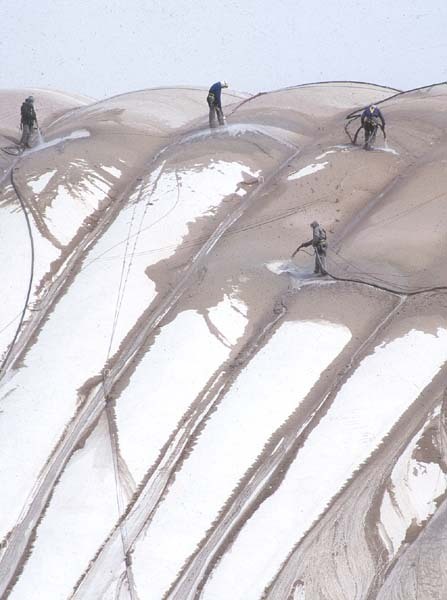 At right, workers sandblast the roof of the C.N.I.T. at La Défense as part of the transformation from its original use as an exhibit hall to a modern office and retail complex. 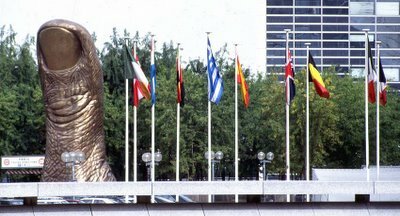 Begun in the late 1960s, the over 300 acre development at la Défense is home to many French and international corporate offices, as well as hotels, residences, theaters, and shopping centers. The central axis, or esplanade, is for pedestrians (cars move around the development on a depressed ring road and trains run beneath) and features many fountains, small squares, and prolific public art. The neighborhood is named for a monument to the defense of Paris during the Prussian siege of 1870 (Franco-Prussian War); the monument was erected on the site in 1881 and can still be seen near the Agam Fountain on the esplanade. The Grande Arche, completed in 1989, is essentially an office building and includes a gallery and outdoor viewing platform at the top. On a clear day, the views of the whole of Paris from here are unforgettable. 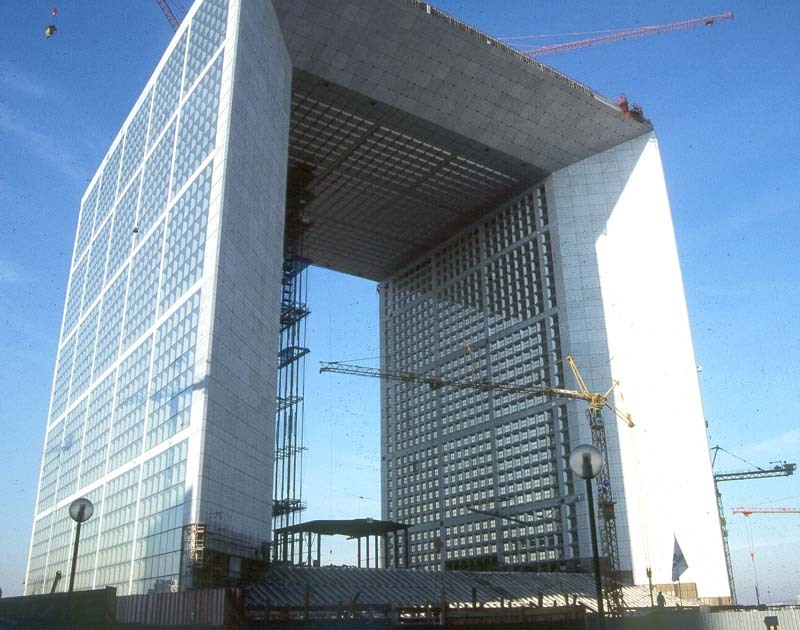 The Grande Arche, seen here under construction in the 1980s. The cathedral of Notre Dame could actually fit in the space under the arch. Where ever you end up, be it the Grand Arche or the Arc de Triomphe, returning to the starting point is a simple métro ride on the #1 line, or hop the RER A line for a quick trip back to the center of the city. 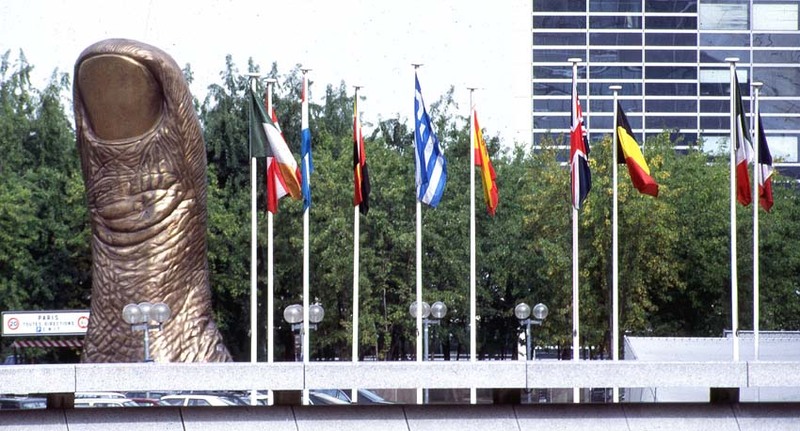 Another public art piece at La Défense, César's Thumb (le Pouce), created in 1965 by the artist César Basdannini. Look for the next in the series of Paris tours this coming weekend. The topic will be the Historic Axis from the Louvre to the Arc de Triomphe and beyond to La Défense. 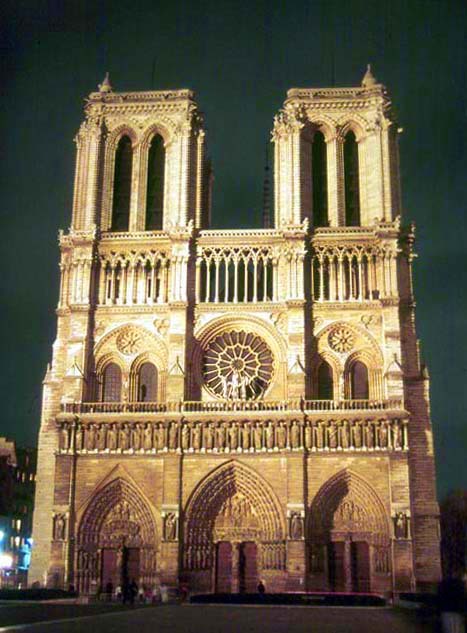 The physical center of Paris is the cathedral of Notre Dame de Paris, the point from which all distances in France are measured. Notre Dame is on the Ile de la Cité, the larger of the two central islands in the Seine River. The Ile Saint Louis is the smaller one. Historically, there were about seven islands. Over time, people filled in the spaces between them creating the two islands we see today. Start at Notre Dame Cathedral (the closest métro station is Cité, but St.-Michel is just across the river to the south). The building was begun in the 12th Century and is a glorious - though not the most spectacular - example of gothic architecture. 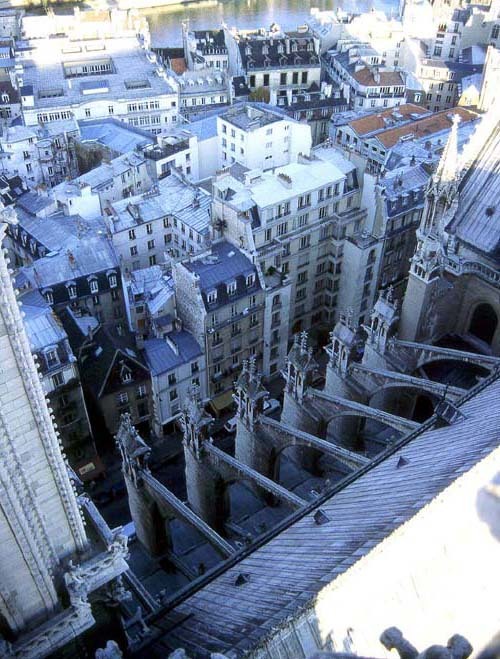 For a fee, you can climb the bell towers for impressive views of Paris. On the square (parvis) in front of the cathedral is the entrance to the Crypte du Parvis, an underground archeological exhibit that includes foundations of 2000 year-old buildings on the site. 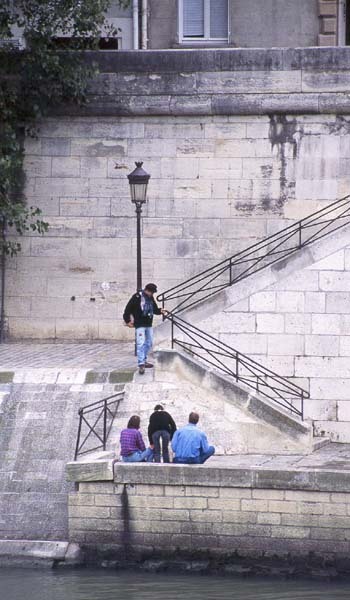 This is the spot where Paris began as a reasonably secure fishing settlement prior to Roman expansion. From the square, walk west, away from the cathedral (down river) along the Quai du Marché Neuf and the Quai des Orfèvres. The river will be on your left, and you will pass the Préfecture de Police and the Palais de Justice on your right. Many of the older buildings in these complexes were once the home of the French royal court, but they now serve as the center of Paris’s (and France’s) justice system. 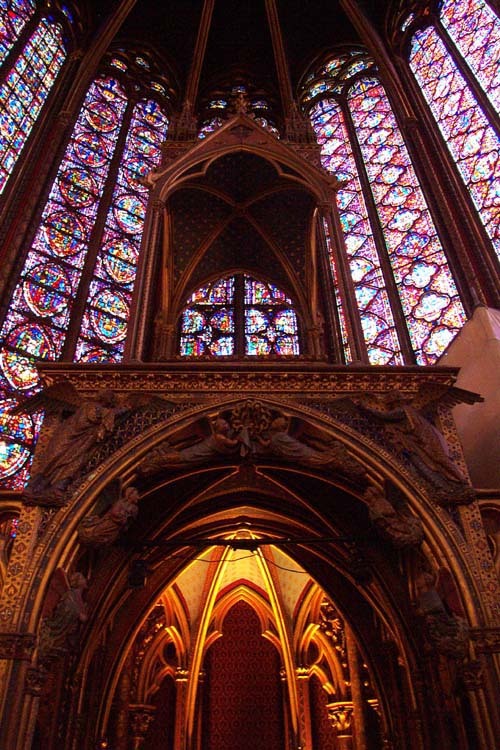 Of particular note is the Sainte-Chapelle (right), consecrated in the middle of the 13th Century, a marvelous example of the lightness of gothic architecture. On the western side of the Palais de Justice, turn right up the rue de Harlay and into the intimate Place Dauphine. The triangular tree-studded place is formed by the Palais on the east and two angled rows of apartment buildings on the north and south. 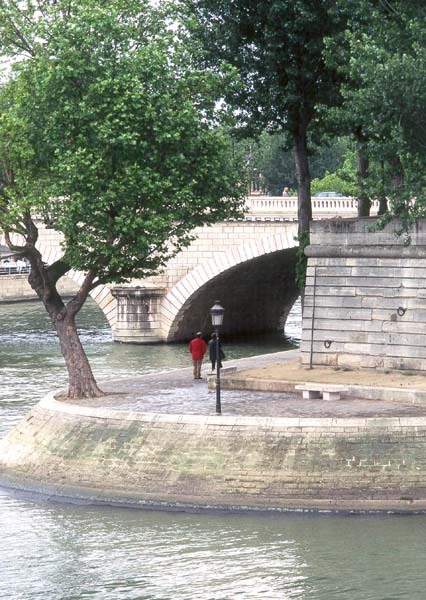 The residential place was developed in the early 17th Century under King Henri IV, whose equestrian statue can be seen just outside the place on the point of the island where the Pont Neuf connects to either bank of the Seine. Exit the place at the tip of the triangle, cross the street to the statue and take the stairs down to the Square du Vert Galant (a nickname for Henri IV), the small tree-shaded park on the island’s tip. 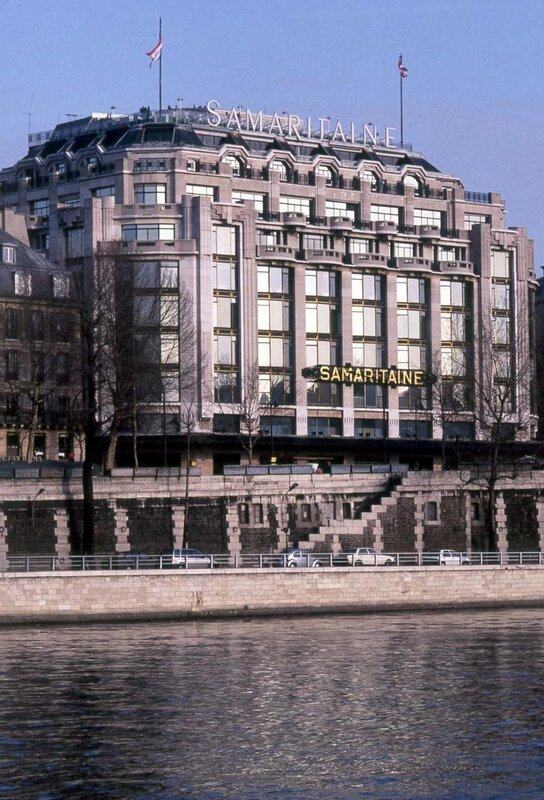 On the right bank you can see the Samaritaine, until recently one of Paris’s major department stores. It was closed in 2005 for business reasons that remain unclear. The store’s many buildings included a restaurant and a roof-top café that boasted great views from the center of town. 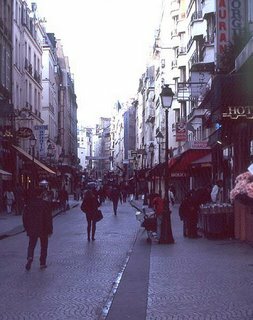 The area around the Samaritaine is home to many other large stores, and along the rue de Rivoli just behind, countless shops and boutiques. Looking down river, you will see the graceful steel arches of the Pont des Arts. 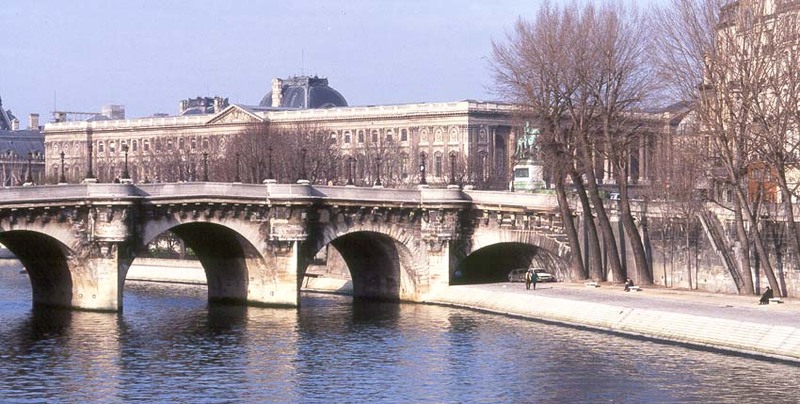 In good weather, musicians and artists vie for space along this wonderful pedestrian bridge, which connects the French Institute building (home of the famed Académie Française) and the Louvre (part of which can be seen on the right side of the photo below). 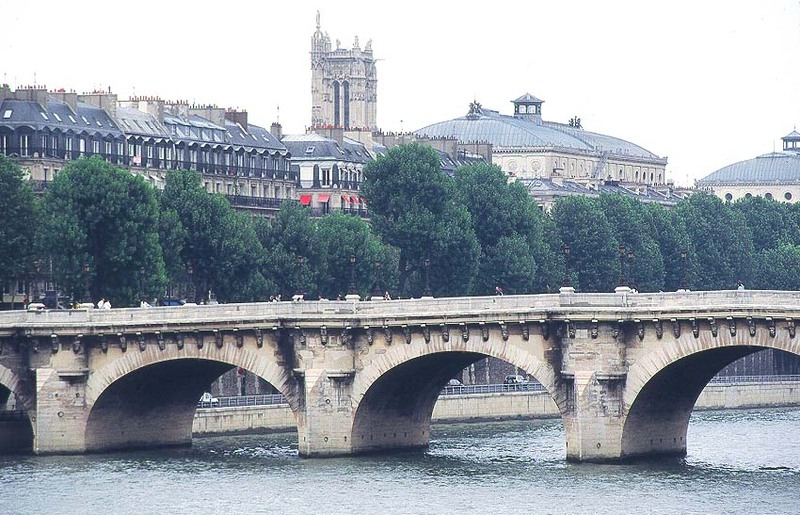 Completed in 1804, the Pont des Arts was the first cast-iron bridge to be built in Paris. 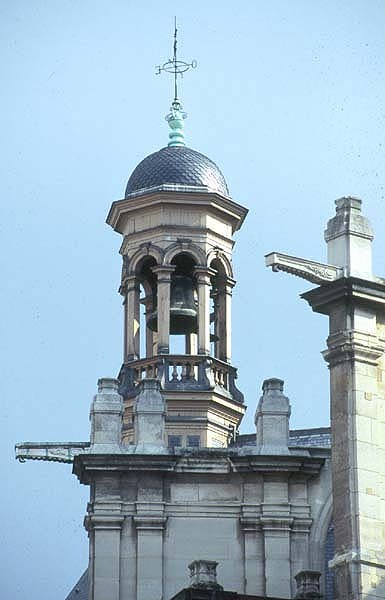 It was irreparably damaged by a boat and closed in 1970. Fortunately, the bridge was rebuilt, this time in steel but exactly replicating the original, and re-opened in 1984. Return to the statue of Henri IV, cross the street and make your way to the north side of the island along the Quai de l’Horloge. You will now be headed up-river. On your right is the Conciergerie, part of the Palais de Justice complex that housed prisoners during the French Revolution, including, most famously, Marie Antoinnette. The Tour St. Jacques and theaters at Châtelet. As you continue around the Island, you can stop off at the flower market near the entrance to the Cité subway station. Across the Pont au Change you will see the Châtelet square and theater and the Tour St.-Jacques (above), the only remnant of the church of St.-Jacques-la-Boucherie. 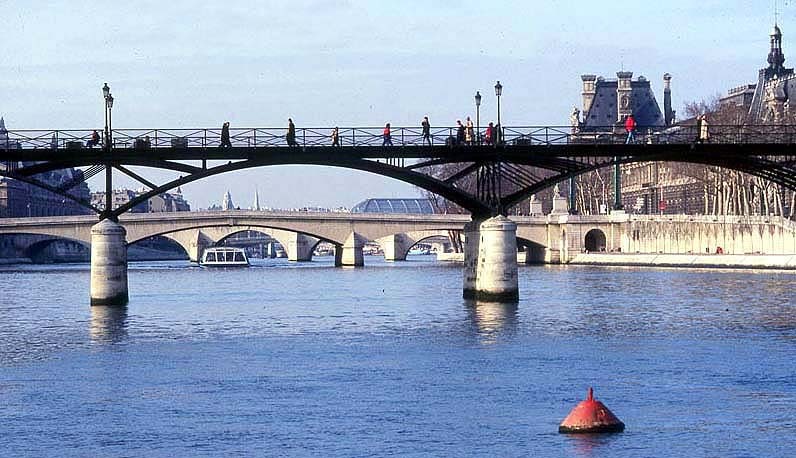 Across the Pont d’Arcole you will see Paris’ City Hall, the Hôtel de Ville, a renaissance style building constructed between the 15th and 17th Centuries. In winter, the square in front of the building hosts a public ice skating rink; various other activities, including demonstrations and protests, take place here throughout the year. An interesting fact: the Hôtel de Ville was the inspiration for the New York State Capitol in Albany. Along the Quai aux Fleurs you will have great views of the tip of the Ile St.-Louis. Continue along the river, or duck into the neighborhood on your right. The street that flanks the north side of the cathedral is full of souvenir shops and cafés and is often crowded with visitors. The Square Jean XXIII at the rear of the Notre Dame Cathedral offers great views of the flying buttresses that help support the building. Further east, at the up-river tip of the island, the small Square de l’île de France is home to an underground memorial to the two hundred thousand French Jews deported to Nazi camps during World War II. Notre Dame's spire at left, Arab Institute in the center, Jussieu on the right. From the square, look across the river toward the Left Bank and you can see the modern glass architecture of the Arab World Institute, founded in 1980. The Institute offers a library, a permanent exhibit of historic Islamic art and often hosts fascinating temporary exhibits. 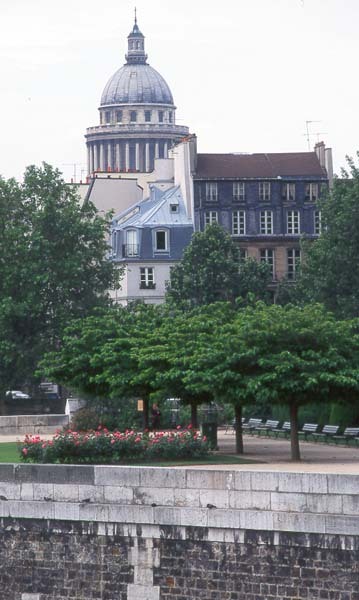 The dome of the Panthéon, while actually on the Left Bank, seems to rise above the square (photo at left, viewed from the Ile St.-Louis). 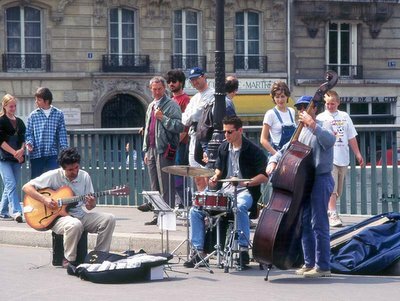 Musicians on the Pont St.-Louis. Exit the square where you entered, turn right and make your way across the Pont St.-Louis, now a pedestrian-only bridge, to the second island. 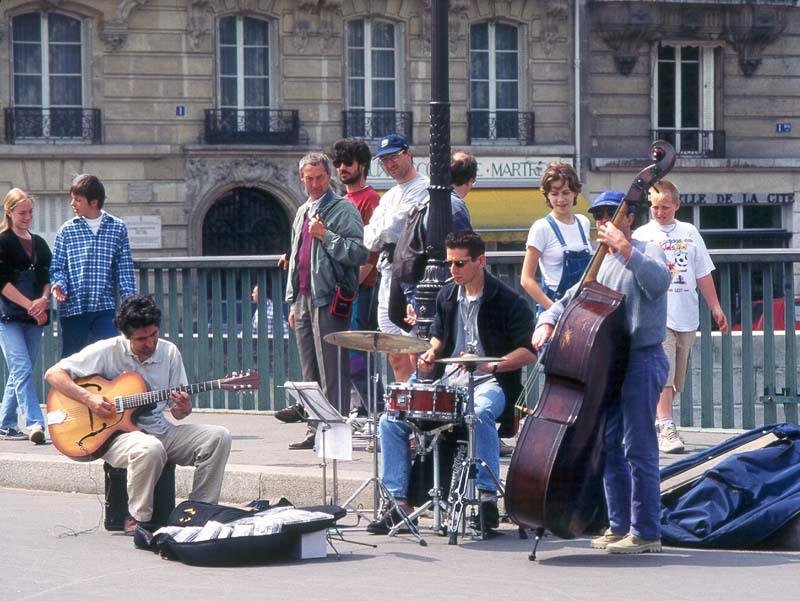 In good weather, the bridge and the square on the Ile St.-Louis are bustling with street performers. Around the square are several restaurants and cafés that fill the sidewalks with outdoor tables – a good lunch spot if you can nab a table. A favorite summer activity here is to stand in line for the delicious ice cream made by the Berthillon company. Enjoy a cone while walking around the island clockwise along the Quai de Bourbon. The Brasserie de l'Isle St.-Louis on a summer evening. Keep an eye out for plaques on the houses commemorating famous architects, owners, or occupants. The Ile St.-Louis was originally developed in the mid 17th Century under King Louis XIII as an exclusive residential quarter for well-to-do businessmen and members of the royal court. Note the rectilinear street pattern on this small island. Continue to the Pont de Sully, and then turn back into the island’s main central street, the rue St.-Louis en l’Ile, seen at right. Along this narrow but straight street you will find the 17th Century church of St.-Louis en l’Ile and many hotels, shops, and restaurants. Once back at the Pont St. Louis, you can return to your starting point on the Ile de la Cité or make your way to either the right or left bank for more walking.